Nyrenoverad lyxig lägenhet i Historiska Medicis Palazzo. Lägenhet med 3 våningar med mycket hög möbler och ytskikt. Intill Piazza San Marco och Accademia museum (där Michelangelos David hålls). Bara 8 minuter. promenad från Duomo (0. 4 miles), och 4 minuters promenad från San Lorenzo marknad. På en lugn enkelriktad gata, där trafiken är begränsad till invånarna i endast den historiska stadskärnan. Vi avslutade renoveringen i september 2011. Beläget på bottenvåningen i byggnaden. Hiss finns, säkerhetsdörr. Lägenheten har 1 sovrum och 1. 5 badrum, med badkar och dusch. En bäddsoffa i vardagsrummet. Lyxiga finish och extremt bekväma, Queen size-säng och stor bäddsoffa (där 1 mer person kall sova - mot en extra kostnad). Lägenheten har 2 platt-TV (32 'och 22'), gratis trådlöst internet, Blue Ray-spelare med filmer, X-box 360 med GMES, iPod / iPhone-docka station med Harman-Kardon HiFi. En komplett kök finns på bottenvåningen tillsammans med alla verktyg, mikrovågsugn, ugn. Espressomaskin, tvättmaskin, Oberoende värme och luftkonditionering finns också och alla ingår i kostnaden. En stor park ligger 3 minuters promenad från huset, perfekt för jogging i historiska Florens. Parkering finns bara ett halvt kvarter bort på din avgift (cirka euro 45 per dag), cykel och skoter uthyrning bara ett halvt kvarter bort. Vi skulle vara glada att rekommendera dig de bästa restauranger och sevärdheter, samt hjälpa dig med alla frågor du kan ha under din vistelse. Vi kommer att ge sängkläder och handdukar. This apartment fulfilled all that was promised, including a very comfortable bed, two elegant bathrooms, comfortable furniture, all very tastefully appointed. Nice comfy robes were a pleasant surprise. The kitchen was beautiful and we were greeted on arrival with fruit, prosecco, Chianti, Nespresso with supplies, pasta and all the amenities of home. We were so centrally located that we never required a cab. Walking to all the many museums and churches in Florence was never more that 15 minutes, and we had fun mingling with the students from the nearby Accademia, singing karaoke at local trattoria's nearby. Our hosts were on the spot to answer our few questions, providing us with wireless speakers to allow us to play our music from our phones. We stayed for one week, and enjoyed living like a local. We would return in a heartbeat. We loved this apartment. We were there for about a month and loved every minute. Not only is the apartment impeccable but everything in it is also of the highest quality. Top-notch furniture, dishes, linens, etc. The furniture was old school comfort, murals in the hallway and on the door, a huge and beautifully designed kitchen/dining room, elegant bathrooms. Living in this apartment really made us feel immersed in Florence. Location is very near to Il Duomo but just far enough so that you don't have to deal with all the tourists. Plus it has so much great food nearby. The only downside was that the wireless could be a bit hit and miss at times. Otherwise this place has it all. My wife and I stayed at this apartment on the Via Santa Reparta for ten days. We were meet by Paolo (Mario’s brother) when we arrived at the apartment. Paolo showed us around the apartment and explained how things worked. Paolo also lives in the building. The apartment is clean and more than ample for two people. My wife and I enjoyed making breakfast in the huge and well equipped kitchen. The online pictures are excellent representations of the apartment. It is truly beautiful. The apartment is well located and within easy walking distance of major sights including San Marcos, the Duomo, San Lorenzo, the Medici Chapel, Central Market, Uffizi, San Croce, Pitti Palace, and the artisian shops in the Oltrarno. In addition, you will find several grocery stores, bakeries, and restaurants around the corner. If you are planning to take the train for side trips, Santa Maria Novella station is within walking distance. Paolo is a gracious host and helpful in everyway. This is a great place to stay if you are visiting Florence. Convenient location, spotlessly clean, solicitous landlord -- everything we could have wished for. From the warm welcome and tour of the apartment, to the same kind attentions paid to making our departure smooth, it was the perfect place to stay. Walking distance to the places we wanted to visit, including the Pitti Palace across the Arno, and just around the corner from Cafe Rainer (best pastries in town) -- the apartment is as described, including many thoughtful touches to make the visitor feel at home. The internet needed a bit of adjustment but the landlord was immediately responsive, and it was fixed, and stayed fixed for the duration of our stay. We would gladly return. What a wonderful place to stay in Firenze! Paolo was incredible, and gave us such a warm welcome and shared with us all that Firenze has to offer. And when our luggage was lost for many days, Paolo stepped in and called the airlines repeatedly and made several trips to the airport on our behalf. Were it not for him, I think we would still be looking for our luggage. 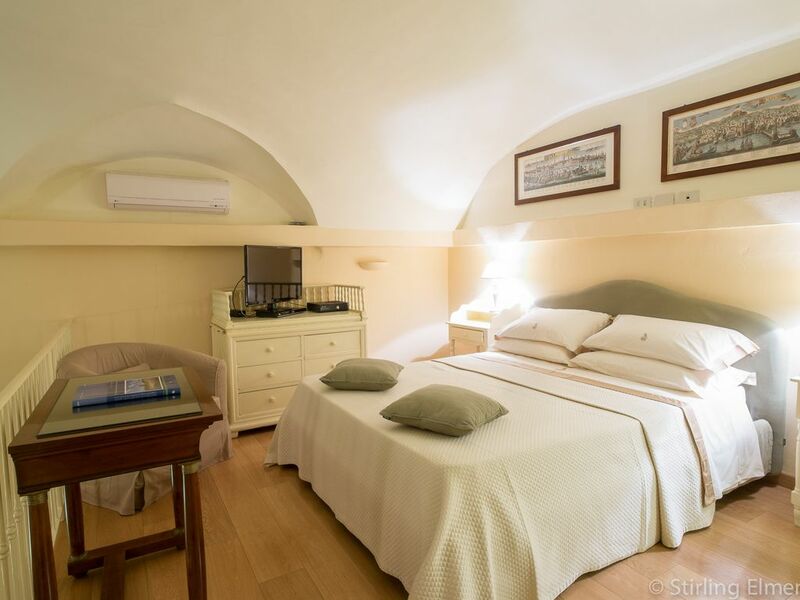 The location of the apartment is perfect, and the apartment is extremely comfortable with all the special touches of a top hotel, and the added bonus of being a historical palazzo allowing you to absorb the history of Firenze right in your own little home. I should add that I have spent over 40 years in the hotel industry with top hotels and resorts, so I have a very high bar for accommodations and service, and this did not disappoint. The kitchen is charming, and Paolo had the kitchen table set with everything we needed for the first night, including a much desired glass of wine. The loft area gave us some separation, and the bathroom is large and spacious. Additionally, as two women, which included an 18 year old, we felt very safe in this apartment, even coming and going in the evenings. We walked everywhere. This was my very first experience with VRBO, but it won't be my last. Thank you Paolo, I hope to return again in the future! The apartment is so comfortable, and beautifully decorated, and smells so fresh and lovely, we hardly wanted to leave!! We felt like we were living in a palace apartment. The service provided went above and beyond!! Paolo welcomed us and provided all kinds of helpful information about the neighborhood conveniences and city recommendations. The kitchen table was set and ready for us to enjoy a variety of delicious snacks, treats and refreshments. What a surprise, and a very delightful way to start the stay in Florence!!! The living area was so comfortable to hang out and relax, with music and excellent wifi. The lovely kitchen was a nice place to start the day with a fresh cup of espresso from the Nespresso machine. The bathroom was quite large and even had robes. The soft sheets and nice bed make for a great night's sleep. Everything you could want is provided, and plenty of space to make yourself at home while you try to live like a local. The apartment is in a great location, very easy to walk to everything you want to see, but also close to a bus stop. Paolo arranged a taxi for our departure to the airport, which was so helpful. The whole process was easy, starting with booking with Mario. We were searching for nice, clean, comfortable, good location....but we got so much more than that!! Beautiful, luxury, excellent service, with royal treatment..Cannot say enough about how wonderful it was, wish we could have stayed longer!! Occupants will leave the premises in as good a condition as they found them at check-in, and will be responsible for any damage caused by occupants and their guests. A checklist will be compiled at arrival and signed off at departure as well as local contract. Copy of a document will be required on arrival.